Today my wife decided that it was now warm enough for some of the potted plants which are brought in for winter, to go back outside. From the studio, a good fifty yards from the house, I heard a blood-curdling shriek so went running to save my wife from what was clearly a life-threatening situation. She had lifted a plant from its saucer, to reveal the thriving nursery of an ant colony which had obviously been living in the plant pot for some time. I rescued what I could, relocating them behind the studio. Sadly I was too late for the second batch. By the time I returned my wife had already re-potted the plant and despatched the colony. 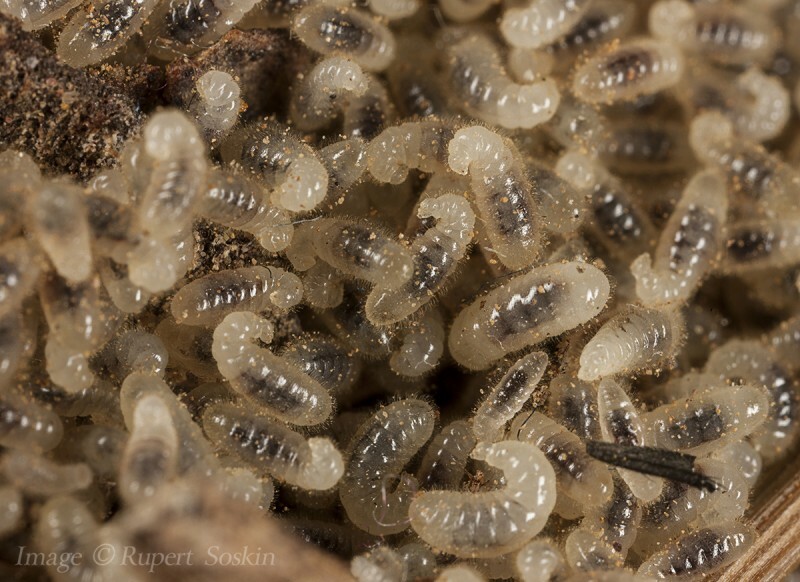 These larvae are quite hairy so I'd guess they are probably Yellow Meadow Ants. Sadly no shots of adults, they were so quick to relocate the larvae that I had moved, and were long gone by the time I returned to take more photos just minutes later.